Before you start laying tile or stone for a new patio, you need to build a foundation. With a proper foundation, your patio will last for years. Without one, your patio stones or tiles will shift and crack. There are two types of patio foundations, mortared and mortarless, or dry-laid. A mortarless patio foundation uses compacted sand and gravel as a base rather than concrete. The advantage of this type of foundation is that it does not require a drainage system. If constructed properly, a mortarless foundation can be just as strong as one that uses mortar. Measure the dimensions of your patio and mark the corners by pounding garden stakes into the ground with the rubber mallet. String the cotton string between the garden stakes to mark the edges of the patio. You can ensure that your patio is perfectly rectangular by measuring diagonally from one corner to the other across your patio site. Each diagonal should measure identically if your rectangular patio is laid out correctly. Cut the sod by inserting the flat garden spade into the ground down to the depth of your foundation. Remove the sod down to this depth using your shovel. Soak the foundation of this trench with a garden hose and tamp the ground flat with a tamping tool. Evaluate that the ground is flat by, placing the plywood sheet on the ground and measure with a carpenter's level. Cover the ground of your patio trench with landscape sheeting to form a weed barrier. Pour gravel onto the landscape fabric to create your sub-base. Ensure that the gravel has rough edges, so that it will compact better for a stronger foundation for your patio base. Compact the gravel to a depth of 4" using the gravel compactor. This will make a strong foundation that will not shift or crack. Pour play sand over the top of your gravel. Using the rake, smooth the sand over your foundation surface. If your patio touches the foundation of your house, the sand should gradually slope away to ensure that water does not run onto your foundation. Compact the sand base to a depth of two to three inches. Install the border around the edges of the patio by pounding it into the ground. 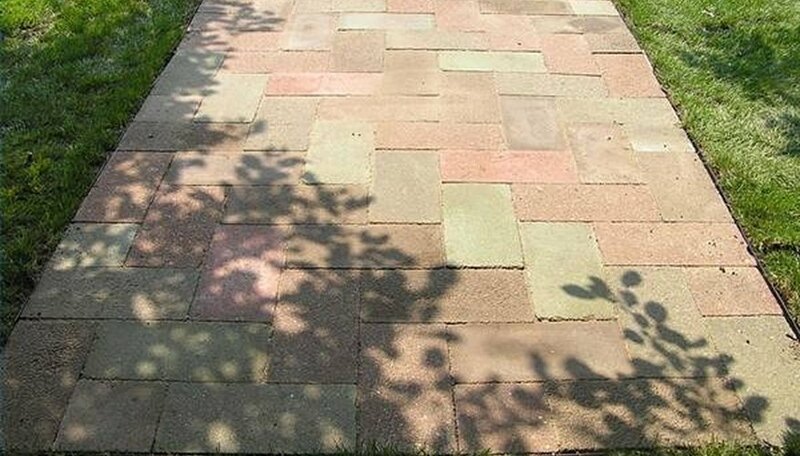 This will block runner grasses from working their way under your patio, and give your patio a finished look once the paving materials are installed. Your foundation is now ready for the patio's surface to be laid on it.